Defender Ben Mee admitted that he hasn’t given the January transfer window a second thought despite the Clarets facing a race against time to get their business done. It’s been a quiet window so far for Burnley, with only Jimmy Dunne and Ali Koiki moving out on loan, joining Sunderland and Swindon Town respectively, and deadline day is fast approaching. Turf Moor chief Sean Dyche has yet to make any reinforcements during the mid-season market and trading will cease at 11 p.m. on Thursday. 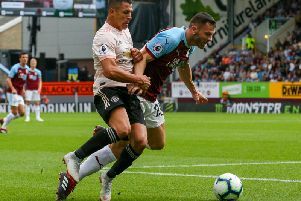 This month has been notoriously quiet for the Clarets, since 2014, with only the likes of Ashley Barnes, Michael Keane – permanent after a loan – Paul Robinson, James Tarkowski, Joey Barton, Robbie Brady, Ashley Westwood and Aaron Lennon acquired, along with Georges-Kevin Nkoudou on loan. But Mee isn’t concerned by the lack of activity off the pitch. “It’s not for me to decide, we’ve just got to carry on with what we’ve been doing,” he said. “We’ll let the powers above - the manager and the chief exec - decide what is best for the squad and for the club. “They make those decisions and we go out and play. “Whoever is out there playing will do their best and that’s all that we can do. “We’re good players so we’re not concerned. “If they want to bring in some players and strengthen the squad then so be it. “If they don’t we’ll carry on as we are. “We’ve got good players and we’ll keep going until the end of the season. Instead, the 29-year-old centre back is focussing all his attention on the forthcoming game against Manchester United at Old Trafford. The Red Devils have been re-energised under Ole Gunnar Solskjaer, winning eight games on the bounce across the board with six of those in the Premier League. The caretaker boss moved ahead of United legend Sir Matt Busby for consecutive wins at the beginning of a managerial tenure and Mee fully acknowledges the challenge ahead. He said: “It will be a tough game. “It’s widely known that they’re playing well and they’ve had a good start under their new manager. “We’ll go there with confidence and it should be a good game. “We picked up a good result there last time and we’ve generally done well there over the last few years so hopefully we can get another good result on Tuesday. “He’s brought a bit of life to them, they’re a counter-attacking side, quick on the break, so we’ll need to watch out for that. However, with the Clarets embarking on an impressive unbeaten league run of their own, Mee added: “It doesn’t concern us, we’re going to go there with a gameplan. “We’ve been on a good run in the league so we’ll go there with plenty of confidence as well. “We’ll look to take on the challenge. “A game at Old Trafford is always going to be tough. “It’s never going to be easy, no matter which team is picked or who the manager is now.